Port Elizabeth’s solids manufacturing team is driving delivery improvement through four performance excellence behaviours in order to attain world class status. We are committed to promoting the efficient use of resources such as energy, water, packaging and production materials with due regard to the scarcity of natural resources and the environmental impact resulting from the utilisation and application of such resources in conducting our business activities. 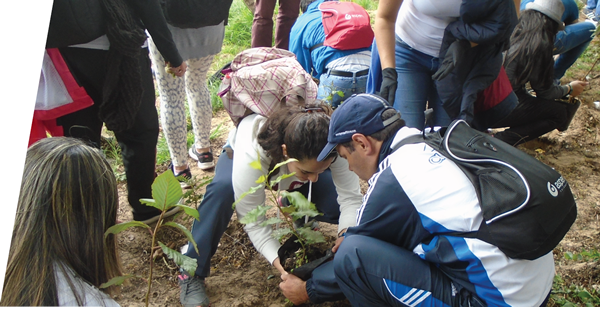 We are a signatory to the UN Global Compact and fully support global initiatives aimed at protecting the environment and conserving natural resources. The implementation of our Environmental Management Protocol (incorporating the Group's environmental management principles) and compliance with all applicable environmental legislation is the responsibility of designated business unit executives. Our Board monitors the status of environmental risks through the review of material environmental management performance indicators at scheduled intervals. In addition, any significant environmental risks are escalated through the Group risk management process. The S&E Co assists the Board in monitoring compliance to the relevant environmental legislation and adequacy of environmental management systems. Under the direction of a Group executive, the Group SHE Department develops and promotes our environmental management principles and standards, monitoring the alignment of business unit environmental management systems to the Group's standards. Our environmental management systems are aligned to global standards, with 87,5% of the fully commercialised primary manufacturing facilities and 71,4% of the API manufacturing facilities currently complying with ISO 14001:2015. A phased plan is in place to implement ISO 14001 at FCC Cape Town by the end of 2019. The Sioux City and Ghana sites have been excluded for certification due to the limited scale of the operations. During the year, a number of environmental training interventions were conducted across the manufacturing sites to ensure consistent application of environmental principles, standard operating procedures, compliance with legislative requirements and to create awareness of new developments. The Group participates in a number of industry platforms in order to keep abreast of initiatives and technological developments focused on the efficient use of scarce natural resources. Awareness campaigns were rolled out across the Group in celebration of World Water Day and World Environment Day. The overall compliance results for 2018 were satisfactory with a 38% percent reduction in environmental legal findings across the Group. The most notable reduction was achieved in the waste management category. No material fines were paid in respect of environmental non-compliances this year. 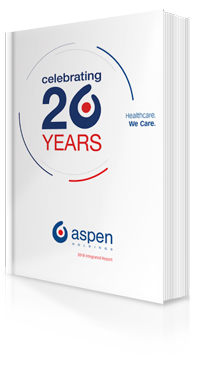 The Aspen Code of Conduct for Suppliers and Service Providers requires our vendors to conduct their business in an environmentally conscious manner and to ensure compliance with the applicable environmental legislation. The identification of suitable activity-based intensity measures for material environmental KPIs is a key project for the Group. We have completed a two-year study during which data was collected and analysed to determine the most relevant and reliable metric. We are now in the process of integrating the activity based intensity measures into our environmental monitoring and reporting systems, using a phased approach. The implementation of activity-based intensity measures will facilitate our ability to accurately measure consumption patterns and production efficiencies and drive conservation projects. As reported extensively previously, the age and design of the Moleneind site that was acquired from MSD in 2013 presented an inherently high SHE risk. Since our acquisition of the site, we have implemented a number of risk mitigations to reduce the SHE risk and have worked proactively with the authorities to address concerns. During the year, we transferred certain of the highest risk chemical operations from this site to the De Geer and FCC Cape Town sites as well as to a third party, with only biochemical and lower risk chemical production remaining at the Moleneind site. We decommissioned a production facility and a solvent recovery unit at the Moleneind site and completed the construction of a modern multipurpose solvent recovery unit at the De Geer site. The soil contamination risk at the Boxtel site remains, and accordingly the environmental liability has been retained in this regard (refer to note 16 in the Group Annual Financial Statements). The investigation by the authorities in relation to five specified spills that allegedly occurred at the Moleneind and the De Geer facilities during April and May 2014 has been concluded. The Public Prosecution has now to decide whether or not to further pursue this case. We recognise the potential environmental, social, political and economic implications of climate change as a significant issue. Our environmental management principles promote the containment and reduction of our carbon footprint in our operations and in the broader supply chain in a technically and economically feasible manner through structured systems of environmental monitoring, reporting and management. We pursue this objective through the investment in energy-efficient equipment and the utilisation of green energy technologies where feasible. In accordance with GMP regulations, we have installed technically advanced air handling systems and exhaust filtration systems at all relevant facilities to maintain the correct environmental conditions and minimise the risk of the release of harmful substances into the atmosphere. Through the implementation of periodic stack emission tests, we have established that the systems implemented have minimised harmful air emissions to the extent that reduction targets are not applicable. Scope 2 emissions, comprising purchased steam and electricity, represent our largest source of emissions. The main sources of our Scope 1 emissions are from fugitive refrigerants, and the consumption of fuel and natural gas, primarily used for the production of steam and the operation of Aspen-owned vehicles. Scope 1 and Scope 2 emissions for the Group have decreased by 9,2% and 7,1%, respectively. Closure of the solvent recovery unit at the Moleneind site resulted in lower natural gas consumption which led to a reduction in Scope 1 emissions. Additionally, the reduction in Scope 1 emissions is partially attributable to the discontinuation of the use of refrigerant (R22) at the Vallejo and Johannesburg sites. The closure of the solvent recovery unit at the Moleneind site, re-configuration of an HVAC system together with a reduction in the HVAC load at the sterile facilities in Port Elizabeth, and a change in the emission factor for Vallejo's electricity, contributed to the reduction in Scope 2 emissions. We continue to participate in the Carbon Disclosure Project and maintained a "B-Management Level" rating for CDP 2017. Companies at "B" level are assessed as having taken further steps to effectively reduce emissions, indicating more advanced environmental stewardship. As part of the pharmaceutical and chemical industries, a large portion (27,9%) of our waste is classified as hazardous. Specific systems and processes are in place to manage both our hazardous and non-hazardous waste in compliance with the waste management legislation applicable in each territory. We use specialised licensed waste management service providers to manage the transportation, treatment and disposal of waste in accordance with contracted terms and relevant legislation. Waste recycled has increased by 5,5% in line with waste generated. The continuous promotion of waste recycling as well as initiatives to significantly reduce waste disposed to landfill is ongoing for the entire Group. The Group recycles 81,1% of waste generated and only 3,2% (2017: 4,5%) of waste generated is landfilled. The quality of effluent discharge is monitored and controlled across all sites, in accordance with local municipal by-laws. Water treatment plants are in operation where required to ensure legal compliance. In the event that there is a deviation from the required standards, a thorough root cause analysis is conducted and corrective action plans are implemented. As at year-end, none of the Group's business units were located in conservation areas or areas of high biodiversity. A total of four significant spillages were recorded in 2018, in comparison to five in 2017. All spillages were partially contained with little or no impact on the environment. The necessary corrective actions were taken to prevent recurrence of these incidents. We use water extensively in our manufacturing processes, in the cleaning of our equipment and facilities, for employee hygiene, in steam generation and to maintain the required manufacturing environmental conditions. 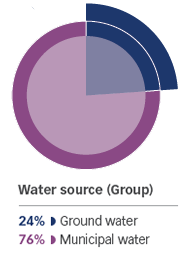 Municipal water is the primary source of water across the Group, although groundwater is also used at the manufacturing sites in Notre Dame de Bondeville, Oss, Dar es Salaam and Vallejo. Water scarcity and water supply are global risks that are increasing in impact and probability. In addition to climate change related risks, sustainable water supply is further exacerbated by increased urbanisation and the ageing municipal infrastructure in certain areas. As a scarce resource, we recognise that initiatives aimed at conserving and harvesting water will contribute to more sustainable water availability. We are committed to responsible water management and usage at all our manufacturing facilities as per the stated environmental management principles. We are currently undertaking a baseline water risk assessment for all manufacturing sites using a web-based tool in order to better understand our exposure to these risks and inform our future sustainable water management and water stewardship initiatives. The assessment has shown that our sites in Cape Town, Port Elizabeth and Tanzania are located in the highly stressed Berg-Olifants, Mzimvubu-Tsitsikamma and Msimbazi river basins respectively. El Niño-triggered drought affected agricultural production and economic growth throughout South Africa. Cape Town was particularly hard hit, and a lack of good rains and the subsequent low dam levels that supply the city had resulted in a critical water shortage triggering the implementation of stringent water restrictions as part of the "Day Zero" campaign. As a response to this risk, our Cape Town site recognised that the low rainfall levels, experienced during 2015 and 2016 had significantly increased the risk to operational sustainability and began to prioritise projects relating to environment and water conservation. Water conservation initiatives included the installation of process and utility water recovery and recycling systems and the reconfiguration and optimisation of the purified water system operation to decrease water rejection cycles. In addition, the site identified the need to investigate alternative sources of water supply. Following an aquifer study, a borehole that has the potential to supply 2,5 times the site's daily water requirements was drilled. A water treatment plant, with 60% capacity for the site's daily needs, has been installed and is undergoing final ancillary equipment installation and commissioning. It is estimated that as a result of these initiatives, the site has reduced its water consumption by as much as 52% over 2016 levels, and will be able to operate without reliance on municipal supply once all planned projects are completed. Recycling of cooling water and reuse of rejected water from the reverse osmosis process are some of the water conservation projects successfully implemented in other sites in South Africa and in Brazil. We participated in the annual Water Scarcity Disclosure Project in 2017 and achieved a performance score of "B-Management Level". Companies at this level are assessed as taking actions associated with good water management. Water consumption has decreased by 5,0% (84 Megalitres). This is mostly attributable to the implementation of resource conservation and optimisation projects at the Port Elizabeth, Cape Town and Notre Dame de Bondeville sites. Decommissioning of the water purification plant at the De Geer site further contributed to the decrease in water consumption. Electricity is a critical resource utilised in our manufacturing processes and is becoming an increasingly expensive commodity. In South Africa, there is a risk of supply interruptions at times of excessive load on the national electricity grid although this has stabilised. Through the efficient use and conscious conservation of electricity we are committed to reducing the impact of increased electricity prices on production costs, and will ensure that critical energy resources are conserved. Additional energy sources utilised by Aspen are fuel, liquid petroleum, purchased steam and natural gas. The Group's annual electricity usage has decreased by 4,2% (29 055 Gigajoules) in comparison to the prior year. The main contributors to the decrease in consumption were the closure of a solvent recovery unit at the Moleneind site, re-configuration of a HVAC system and reduction in the HVAC load at the sterile facilities in Port Elizabeth.